A fish that can grow up to 70 lb + or – and feeds in the shallows. What else could a saltwater angler ask for? 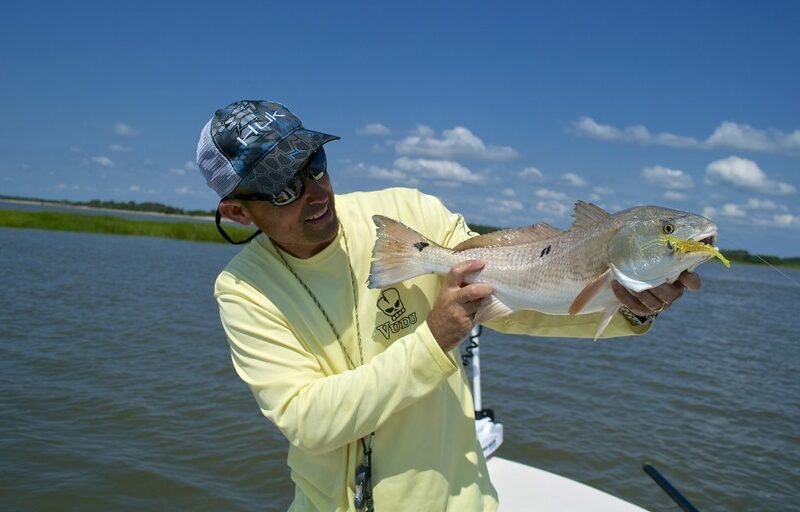 Fishing for South Carolina Redfish, also know as Spot Tail Bass, are without a doubt the most targeted inshore game fish along the Grand Strand. 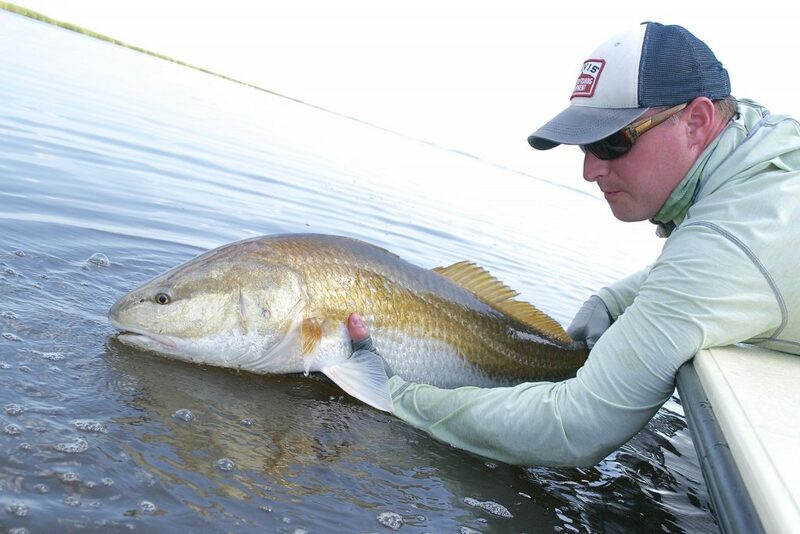 Redfish spend their juvenile years around tidal creeks, surf zones and inlets. Once they reach approximately 4 years old and around 30 inches, they move to open water bays and inlets to congregate with spawning populations. Spawning occurs during the Summer months and into the late Fall around inlets and channels. 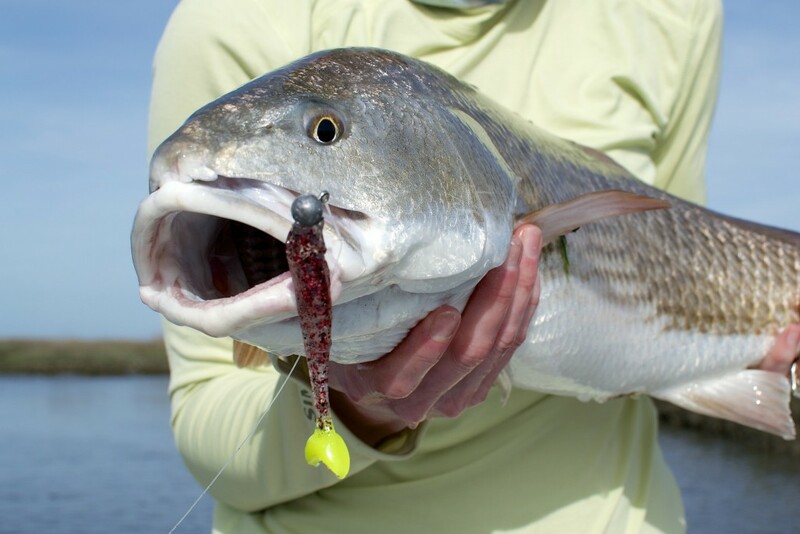 Male Reds will drum to attract females, hence the name Red Drum. South Carolina Reds grow very rapidly and they need food to do so, growing up to 12″ in their first year of life. With that kind of growth rate, they can’t be picky eaters. Crabs, finger mullet, mud minnows and shrimp are their primary diet. Season, water temperatures and tide will usually dictate the lure of choice. The primary baits and lures used on my boat range from plugs to soft plastics. 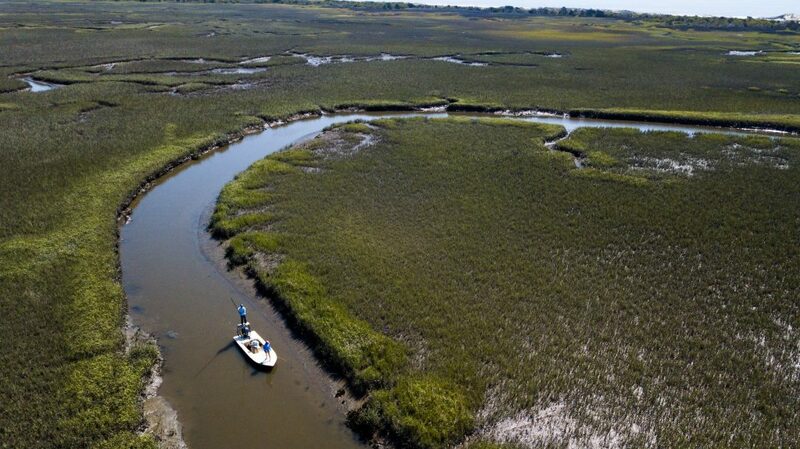 When trying to locate Redfish in South Carolina marshes, a very productive method is simply casting to objectives like docks, oyster rakes and creek mouths. Areas that have these things should hold fish at some stage in the tide, however I have seen some incredibly fishy areas be baron. The trick is to keep moving and working the areas mentioned above. Trolling motors and push poles are amazing tools when trying to locate fish. Easing along while looking for areas with good habitat. When trying to locate fish, it’s hard to beat a spinner bait. The Redfish Magic is a proven winner and emits a lot of vibration that can help pull Big Reds out of the grass on mid tides. Another great combinations is the popping cork rigged with a soft plastic shrimp. I really like the VUDU SHRIMP BAITS. The popping cork is my first choice when fishing around oysters and other structure. The trick to fishing corks is giving a sharp POP, POP every 3o seconds as the cork drifts over the oysters. The sharp popping of the cork can really bring some attention and often trigger a bite. Sight fishing is the most exciting way to fish for Reds! 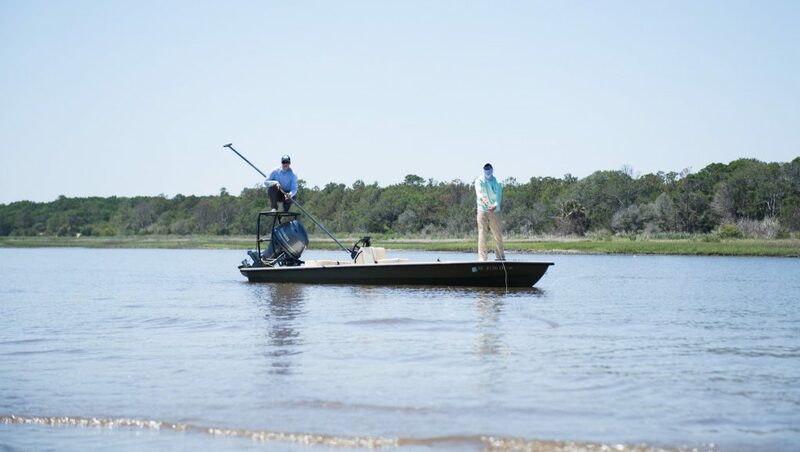 When sight fishing, we’re poling the boat along the shallow shorelines and mud flats. This style of fishing is more like hunting than fishing. From the poling tower I’m looking for signs of Tailing Fish. 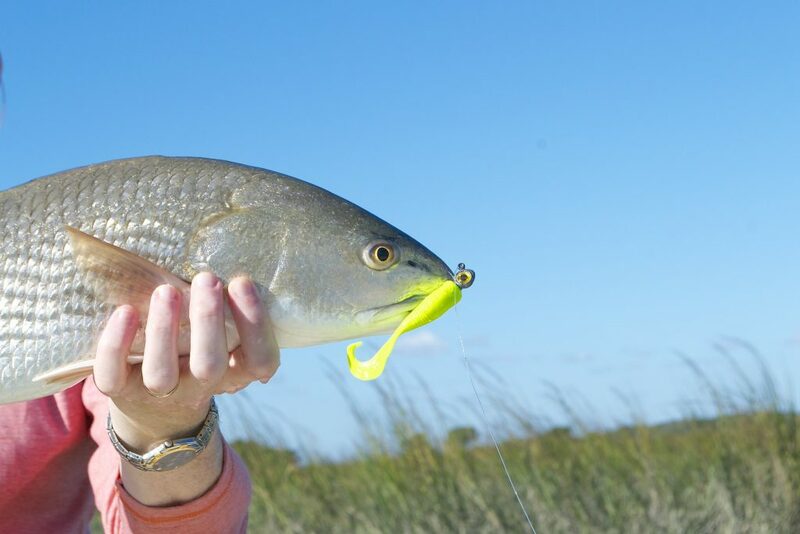 Redfish move onto shallow water grass flats, especially during flood tides, in search of fiddler crabs and tip their tails up while their noses are rooting around below the water. Flood Tides are what really allow me to get into an area where the fish like to tail. The water gets high enough to cover the grass that usually only sees the sun and stays dry. In these unique opportunities that only take place a handful of times a month, I prefer soft plastic baits. Jerk shad or a shrimp rigged with a worm style hook. The worm style hook helps to prevent snags in the grass as we work the bait towards the tailing fish. When working a low tide I’m looking for fish swimming or feeding along mud flats and shallow banks. Redfish can often be seen traveling in small schools, herding shrimp and chasing finger mullet. While the soft plastic on a worm hook is effective, I prefer to use a 3/8 oz jig with a paddle tail. On lower tide cycles Redfish tend to be a bit more spooky. I feel it’s due to the lack of escape options opposed to high tide. The jig allows the angler to present a long cast before the fish can see or feel the boat. Landing the offering just short of the fish in his direction of travel is key. I tell anglers to let the bait sit and as the fish approaches slowly crawl or hop the bait. This tactic usually always triggers a bite. 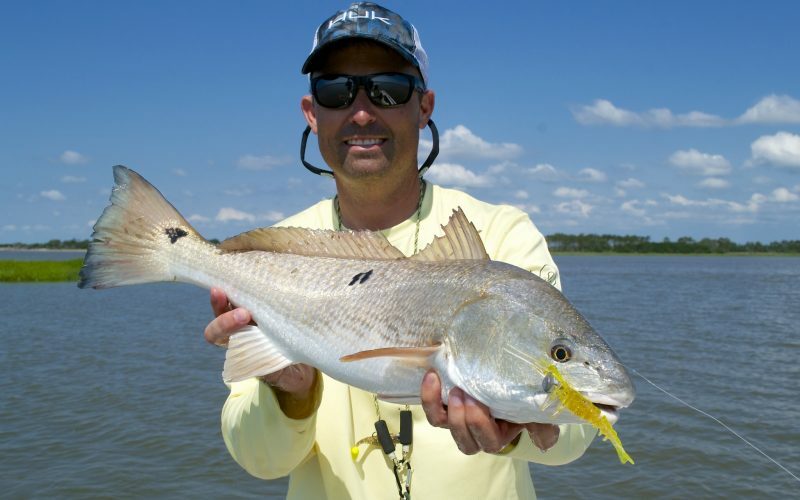 We can all agree when it comes to inshore fishing the South Carolina Redfish takes top prize. As an avid angler and Redfish guide I feel it’s my duty to be a good steward of our natural resources. I believe very strongly in Catch and Release of these amazing game fish. The South Carolina Department of Natural Resources has reported Redfish numbers to be much lower than previous years. This may be due to angling pressure, bad spawning years, or the freeze we recently suffered. First is using circle hooks when live bait fishing. Carolina rigs with short leaders and circle hooks really help prevent gut hooking fish. Wetting your hands before handling fish. Fish have a protective slim on them that acts like their immune system. DO NOT hang large fish from boga style grips, as can put pressure on the major organs of the fish. Fish naturally have the support of the water and hanging fish this way shouldn’t be done when possible. Lastly use heavy tackle when targeting larger fish and get them to the boat as quickly as you can. 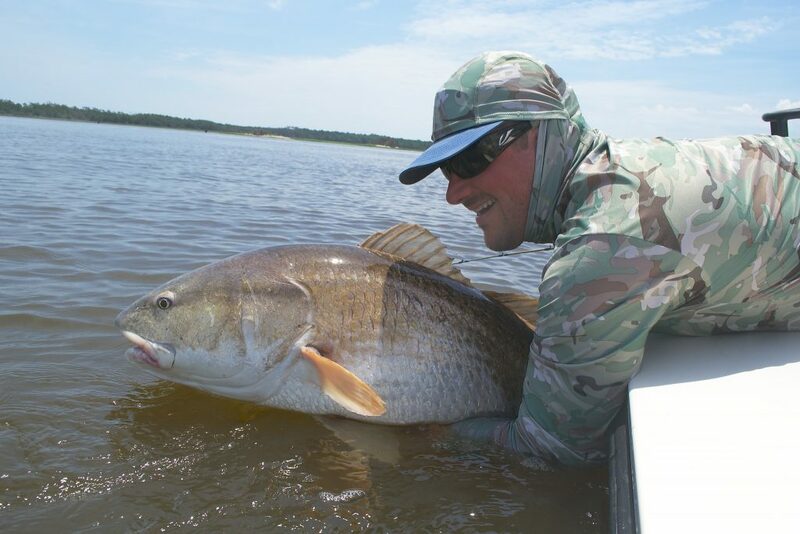 To find out more about South Carolina Redfish or book a charter contact Capt. Jeff Lattig.